Tickets are on sale and are going very quickly for Mustard Seed Theatre’s award winning show, All Is Calm. The Christmas Truce of 1914 is a poignant example of choosing peace and compassion in a time of great distress…a lesson that seems ever so relevant right now. Tickets are still available, and the run has been extended one additional week, but the show will likely sell out. GET YOUR TICKETS WHILE YOU STILL CAN. Luke Steingruby is pleased to announce that he will once again perform in the fourth and final iteration of All Is Calm at Mustard Seed Theatre. At Mustard Seed Theatre, members of the 2015 cast of “All Is Calm” portray World War I soldiers of different nations. The a cappella musical about World War I has become a holiday tradition for some theatergoers. In 2013, Mustard Seed’s first production of “All Is Calm” garnered five St. Louis Theater Circle Awards and big audiences. People warmed to the story of Christmas Eve, 1914, when some soldiers on both sides of the Western Front put down their weapons to mark the holiday. They sang carols (in their own languages), shared food, drink and tobacco, even played a little soccer. It didn’t last long, and it never happened again. Mustard Seed plans to stage the perennially popular musical only once more, however. This year’s production will run Nov. 11 to Dec. 4. After a while, “artists need to do something new and challenging,” explained artistic director Deanna Jent. She added that the switch will allow Mustard Seed to present other musicals in seasons ahead. Once again, Jent will direct “All Is Calm,” and Joe Schoen will return as music director. The ensemble includes performers from previous seasons: Charlie Barron, Steve Isom, Greg Lhamon, Gerry Love, Ben Nordstrom, Antonio Rodriguez, Luke Steingruby, Kelvin Urday and Jeffrey Wright. “All Is Calm” is the second production of Mustard Seed’s 2016-17 season — the troupe’s 10th anniversary season. Mustard Seed Theatre performs at Fontbonne University’s Fine Arts Theatre, 6800 Wydown Boulevard. Single tickets to its shows are $25-$30; 2016-17 season tickets are available, too. For more information, visit mustardseedtheatre.com. I cannot say enough about how beautifully the cast sings and about how completely involved everyone is in the action and emotion of each moment. The 11 actors are uniformly excellent with special nods to local chameleon Charlie Barron and vocal powerhouse Luke Steingruby. A solo by Steingruby towards the end of the show is hauntingly powerful and elicits absolute silence in the theater while patrons bask in its beauty. This is the show’s third consecutive year, and many of the cast members are new to the material this year. Given the stellar performances, these artists clearly connected to the material in a relatively short amount of time. Paul Cereghino gets to open the show as he strolls on stage singing “Will Ye Go To Flanders” before the entire cast joins him onstage. You know immediately that this is going to be something special. Luke Steingruby gets the premiere piece as he does beautifully with “O Holy Night” sung in French. The entire cast is tremendous as both singers and actors including great work by Steve Isom, Ben Nordstrom, Will Bonfiglio, and Gerry Love. Charlie Barron is most effective in several roles and this marvelous cast also includes powerful characterizations by Tim Schall, Greg Lhamon, Kelvin Urday and Tyler Cheatem. I hate Christmas. I hate the commercialism, I hate the maudlin sentiments and I hate the “entertainment” that comes with the season. If there were, in fact, an actual War on Christmas, I’d be on the frontlines shouting “Happy holidays!” at old ladies while drinking from a plain red Starbucks cup. 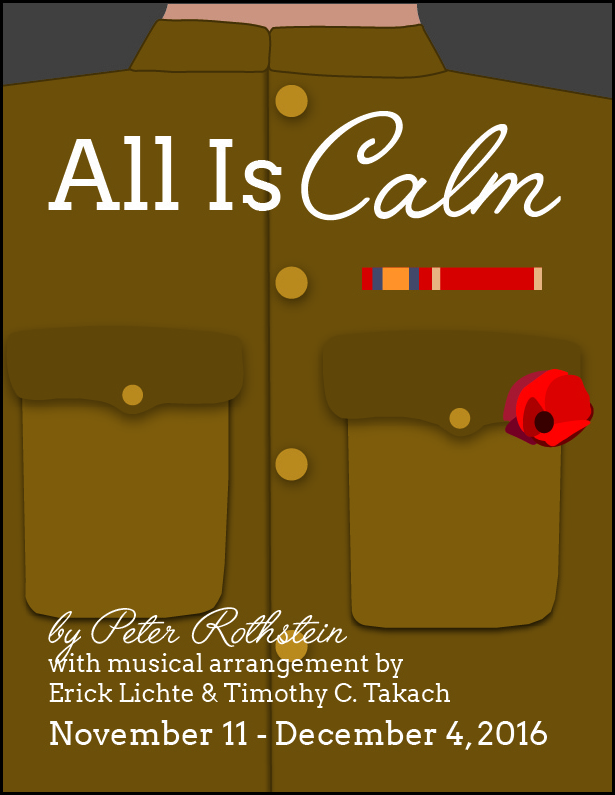 But I love Mustard Seed Theatre’s production of Peter Rothstein’s All Is Calm. For three years running the company has staged this a capella musical about the spontaneous Christmas truces that sprang up on the frontlines of World War I, and every year I enjoy the show more than I did the last. Director Deanna Jent and musical director Joe Schoen together craft a powerful story about peace, love and empathy that shines like a beacon in these darkening days. Directed by Mustard Seed Theatre artistic director Deanna Jent along with musical director Joe Schoen, this hauntingly beautiful and deceptively ‘simple’ one-hour musical is masterfully performed for the third consecutive year, this time with a mostly different cast of 11 beautifully harmonized singers. The accomplished performers blend their diverse voices to affectingly give life to this century-old tale that is both touching and inspirational. An enormously popular production when first performed by Mustard Seed in 2013, All Is Calm won five St. Louis Theater Circle awards, including Best Musical and Best Ensemble in a Musical. This year’s presentation features eight new cast members with equally impressive results. 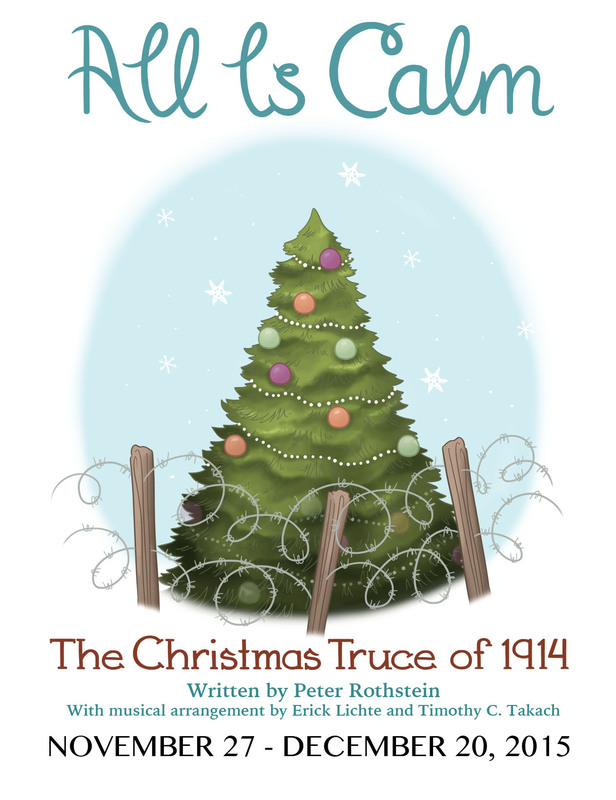 With a script by Peter Rothstein and musical arrangements by Erick Lichte and Timothy C. Takach, this story of the remarkable Christmas truce of 1914—a spontaneous outbreak of peace that occurred at multiple points along the trenches in France—combines splendid and often quite complex a cappella singing with readings of letters from soldiers and other historical documents. It’s powerfully moving and beautifully performed by a fine ensemble of eleven of our town’s most talented singing actors. Back by popular demand, this a capella musical is a poignant look at man’s humanity during a time of war. Based on a true story. Luke Steingruby joins the 2015 cast of “All Is Calm: The Christmas Truce of 1914” at Mustard Seed Theatre.